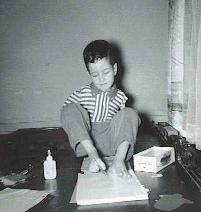 How long did it take you to learn to write with your feet? both at home and in school. Are you left-handed or right-handed? Or should I say left-footed or right-footed? I write with my right foot. I have better control with my right foot. So I guess I'm right-footed! I write with my feet.